Radiance is a residential complex of 4 towers at one of the most popular suburbs of Mumbai Goregaon West by Kalpataru.Kalpataru Radiance is a large project spread over an area of 1.48 acres adding the great outdoors with themed landscaped podium of around 1.6 acres for recreational facilities activities.At the ground floor the towers starts with the double height entrance lobby with multilevel car parking spaces.These luxury towers are available at affordable housing options.The possession date differs from June 2019 to December 2019 to December 2021. Kalpataru Radiance comprises of 2 BHK, 3 BHK and 4 BHK Apartments with height of 10 feet 10 inches. The size of the apartments ranges from 881 sqft to 3,308 sq ft. The floor plan of Kalpataru Radiance presents the most exciting and dynamic floor plans designed for a lavish lifestyle with 29 floorsthat includes 4 level parkingareaswith an abundance of greenery spread across the complex.Many popular hospitals, reputed educational institutions, bank branches, recreational centres, shopping malls, etc. serve the locality.It is completely enveloped by eco-friendly environment/surroundingsusing natural resources like rain water harvesting, sewage water plant, efficient irrigation systems and much more. Kalpataru Group was established in 1969 bythe chairman Mr.MofatrajP.Munot. The Group was one of the largest Civil Contracting firms in the Middle East, based in UAE between the year 1974 and 1982. The groupis known for their modern designs and timely construction.They havecompleted various successful projects including residential properties, commercial, religious establishments and other projects. Kalpataru Group has developed more than 80 landmarks till date. The Group is also undertaking projects in other key cities such as Jaipur, Surat, Hyderabad and Chennai. 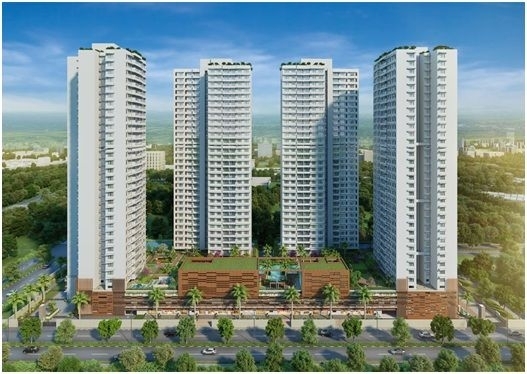 A project with good locality provides number of benefits of living in Apartmentsin the same way the location of Kalpataru Radiance assures that the residents choose the right Apartments for themselves at the right place.Kalpataru Radiance is a combination of signature premium residential towers at Goregaon West. It is at the one of the most prestigious address of Mumbai with many indoor outdoor features and utilities nearby.The Radiance enjoys great connectivity with the Western railway line on one side and the Western Highway& Link Road on the other. Goregaon West is one of the suburbs of Mumbai located in the Konkan region and is situated 11 kilometers away from the city of Mumbai. The property location is a 20 minute drive from the Sahar International Airport and a 22 minute drive from Santacruz Airport. Public transports including buses and auto rickshaws that are easily available in the area. The address of Kalpataru Radiance project lies at Siddharth Nagar Goregaon- West, Andheri-Dahisar, Mumbai. Kalpataru Radiance Goregaon West is well featured with an outstanding facilities and amenities that contains Club House, Health Facilities, Wifi, Gated community, Maintenance Staff, Jogging Track, 24Hr Backup Electricity, Meditation Hall, Pucca Road,Landscaped Garden, Indoor Games, Swimming Pool, Gymnasium, Play Area, Intercom, Rain Water Harvesting, Multi-purpose Hall and Security. Schools: - VIBGYOR High School, St. John's Universal School, Universal English High School Goregaon West, KIdzee, VivekVidyalaya& Junior College,JawaharVidyalaya High School. Hospitals: -Pooja Hospital, AshaKhetan Medical Center, Dr.PradeepGadge's Diabetes Care Centre, KapadiaMultispeciality Hospital, Ashish medical, Siddharth Municipal General Hospital. Shopping Mall/Centres: - City Centre Mall, hirapanna mall, Inorbit Mall, Oberoi Mall, Evershine Mall, Grace Plaza Shopping, MH 02 Fashion Begins Here. Bank/ATMs: - Indian Bank, Allahabad Bank, Axis Bank ATM, Canara Bank ATM, South Indian Bank ATM, Federal Bank ATM, Cosmos Bank ATM - Goregaon West Branch, Kotak Mahindra Bank ATM. Metro/Railway Stations: -Goregaon Station, Malad Station, Jogeshvari Station, Andheri Station. Restaurants: -Sanman Pure Veg Hotel, The Tatus Nook, Tasty Bites, Hotel Savera, Urban Burger, Domino's Pizza, McDonald's, Golden Chariot. Medical Stores/Pharmacies: -HeshPharma, Shiv Shakti Chemist, Sunrise Pharmaceutical, Arihant Chemist, Wellmart Medical Store, Huda Medical, Life Plus Medical Stores. 899 sq.ft. - 1395 sq.ft.